Music can touch absolutely everyone, of all ages, and this means that music therapy can make a difference in all people’s lives. It has been proven in many areas or healthcare, including music therapy, that the earlier the therapeutic input begins, the more successful it is likely to be. It is for this reason that music therapy is recommended with babies in the womb with women who are pregnant, through labour (music therapy, not just music listening, has been researched to reduce pain and maintain calm in both mother and baby), with new born babies and pre-school children. We know that bringing a child into the world is a big step which adds pressure and strain to any family, and that having a child with a disability or condition can increase family pressures to a breaking point. We also understand that losing a child is life-changing, and that the entire family needs support during this difficult time. Music therapy could be the bridge that is needed, whether this is between extended family members, couples, parents and children or siblings together…when words cannot be found, music can make the difference. 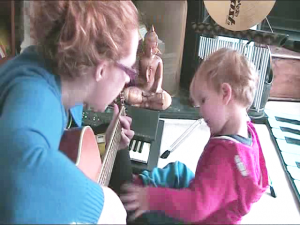 Music therapy has been proven to support development in premature babies, pre-school children and children with additional needs to teach steady breathing and vocalising, reduce pain and discomfort, encourage communication, promote eye contact, awareness and sharing, increase bonds and relationships and most importantly to support the family unit.